Quest Amino Complex 500mg provides a blend of seventeen amino acids including the eight essential amino acids that can only be obtained from the diet. Amino acids are used by the body to form working proteins, such as enzymes and hormones, which drive the biological functions that sustain life. Amino acids also form, build and maintain structural proteins in our body. Recommended to support general health and wellbeing, for regular exercisers, those recovering from illness or surgery, strict vegans and vegetarians and high protein dieters. Amino Acid Complex Powder, Bulking agent: Microcrystalline Cellulose, di-Calcium Phosphate, Magnesium Stearate, Anti-caking agent: Silicon Dioxide, Glazing agent: Hydroxypropylmethylcellulose. Take one or two tablets daily with each meal. Swallow with water. Do not exceed stated intake. Below are reviews of Amino Complex 500mg - 8 Amino Acids - 45 Tablets by bodykind customers. If you have tried this product we'd love to hear what you think so please leave a review. 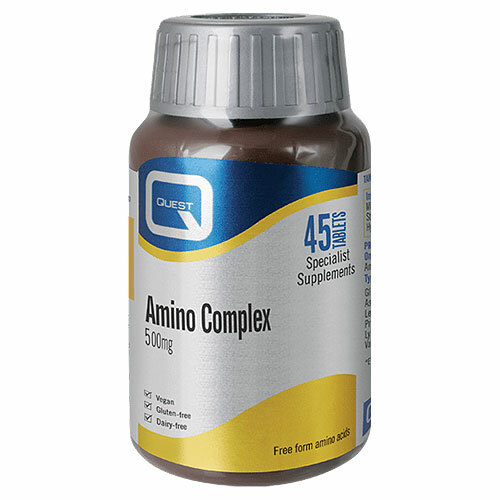 Quest Amino Complex 500mg provides a blend of seventeen amino acids including the eight essential amino acids that can only be obtained from the diet.